The Driskill Hotel in Austin, Texas is considered by many to be the most active as far as unexplained phenomenon in all of the area. 1. There is a room, referred to as that of 525 that is rumored to be one of the most haunted in all of the structure. There is a story of tragedy and despair that surrounds the room, though it is unknown if the stories are true, historically. This is the story that is often referred to as the “suicide brides”. It is believed that two young women, who were on their honeymoon in the hotel twenty years apart, took their own lives in the bathroom of the room. As a result, the hotel staff blocked off the bathroom area, and shut down the room completely. When reconstruction efforts began in the year of 1998, this room was allowed to be opened. Several strange occurrences made themselves evident when this occurred – all the way from unexplained leaks to visions and sensations of apparitions! 2. There was a lady who committed suicide on the fourth floor of the Driskill Hotel. Many individuals claim to have observed what appears to be a spirit of a female out of the corner of their eye while on this floor, but when they look to see who is standing there, there is actually no one available at all. In addition to this, it often sounds as if a female is whispering on the floor. While very faint, those who have heard it do not forget it very easily. In some instances, a woman has been heard crying on the fourth floor by hotel staff – even when no one is staying on that particular floor. It is believed that all of these occurrences are related to the woman who took her own life on the floor. 3. There is a story documented in history in which the young girl of a popular Senator of the time met her fate while chasing a ball along the “Grand” staircase in the hotel. This occurred in the year of 1887. It was reported a week after her death that she was up and playing at the hotel with her little ball. This incident was actually the first recording of the paranormal at the rumored haunted Driskill Hotel. As you can see, there are many recordings of hauntings at this spectacular hotel. While there are many different paranormal events that have taken place at this hotel, this lists the most popular cases. If you are interested in unexplained phenomenon, visiting the Driskill Hotel in Austin, Texas is sure to amuse you! 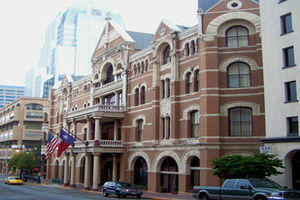 Check for the lowest price, get directions, view photos, and read the reviews and traveler tips for the Driskill Hotel.